The newspaper trade as we know it today was more or less established at the end of the 19th century. With no more prohibitive levies on printed paper, and better printing technology, there were suddenly hundreds of periodical publications throughout Britain. As a result, journal proprietors became more and more market oriented. 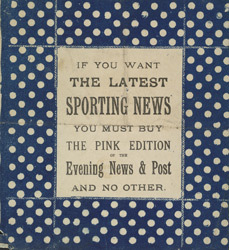 Sporting events were popular at this time and were encouraged by government as a means of unifying the nation. Newspapers would issue reports prior to events and bring the results to the public within a couple of days.